The USBnIND0 and USBnIND1 LEDs reflect the state of the 2 USB port control indicator pins of the LPC1850. The VBUSn LED indicates 5VDC is present on either the VBUS0 or the VBUS1 USB connector. The 8 Port LEDs marked PD_10 - PD_14 and P9_0 - P9_2 connect to their respective port pins when jumper LED is installed. 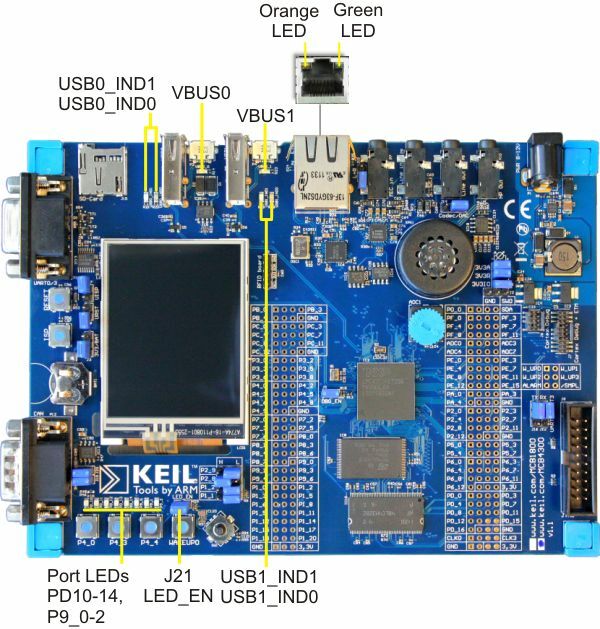 These LEDs are useful for indicating program status while testing your applications. When these LEDs are not required, you may save power by removing the J21 LED_EN jumper.